Like many startups, Carv was born out of an education project, namely a PhD thesis. CEO and founder Jamie Grant completed a Master of Physics at University of Oxford before undertaking a PhD in Financial Economics at Imperial College London. He then applied both these disciplines to his passion for skiing. Frustrated with the learning process for skiing, Grant first experimented with a smartphone app to analyse his performance, but found that the smartphone’s sensors had limitations. He went on to speak with professionals, such as those in Olympic ski teams and discovered the valuable metrics worth analysing required pressure and motion sensors. Four years later, in December 2017, Carv was launched. The world’s first digital ski coach that uses a smart boot insert to capture motion and pressure. When asked which resources were used to get the startup off the ground, refreshingly a book was cited as a source of help – The Lean Startup by Eric Ries, which Murray-Jones said had great information on how to build an MVP (Minimum Viable Product). Aside from this book, they also utilised podcasts, online resources – and of course, people. MotionMetrics used the Hax hardware accelerator programme in China – similar to Kokoon startup. “It was a great decision for us, it still continues to help us. When you are launching a company you are not supposed to know everything – that’s why you are a startup. It is key to find people to help you on your journey. If it is the right route for you to build a product, go through an incubator, with an environment of people who have done it before,” Murray-Jones said. THE BIGGEST SURPRISE SO FAR? Kickstarter was great for Carv in terms of product development, but it was also great in terms of company development, as off of the back of the campaign, MotionMetrics hired employees, struck partnership deals and raised investment. To really understand their market, the team started with an iOS app which they launched to Oxford and Cambridge varsity networks. They then spent three weeks skiing with this community, sharing metrics from the app and gaining feedback. In addition, they work with top Olympic ski teams from the US, Italy and Slovenia, as well as Red Bull athletes and ski instructors in Canada and New Zealand. The team ski with their early adopters from Kickstarter and their investors, and they have even gone on to employ their own backers. “The past five years of wearables have been measure and display – but we believe the next five years will focus on taking that data and presenting it real time,” commented Murray-Jones. The Carv app provides real time feedback and drills – and a Ski IQ based on 35 metrics, allowing competitive skiers to settle scores with friends. Elite level skiers can benefit from Carv as well with Carv Pro which provides 35 metrics for every turn, which allows ski academies to match up video analysis with the raw data from every turn. This would be too much for the average consumer, but is the kind of data that can help win gold medals. Carv Pro will be launching as a premium feature with a monthly subscription. Murray-Jones explained that with Carv, they have built one of the most advanced pressure and motion sensors in the market, and that this could easily translate into applications for other sports – snowboarding for example, but that right now MotionMetrics are a small team focused on getting it right for skiing – their passion. In the future, MotionMetrics will look to partner Carv with fitness tracker products should there be demand. For now, the startup is focused on refining Carv with software upgrades: “We have over-engineered the hardware to be in a really strong position to do a lot with the software and go in multiple directions,” said Murray-Jones. MotionMetrics are currently working on a second version of the hardware that will be built into a ski boot, which will allow them to break into the rental market more easily. This also creates a more streamlined product so that users forget the technology and use the ski boots as a learning tool. “It is great to build a company in an industry you are incredibly passionate about,” summed up Murray-Jones. 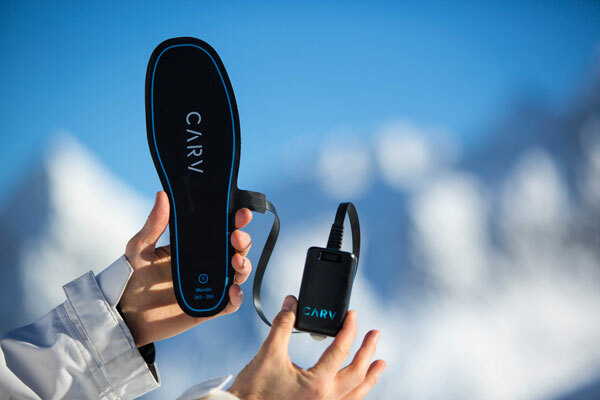 Carv is the first wearable dedicated to skiing that speaks to you as you ski, serving as a digital ski coach.